With spring, my energy returns. With spring, comes life. 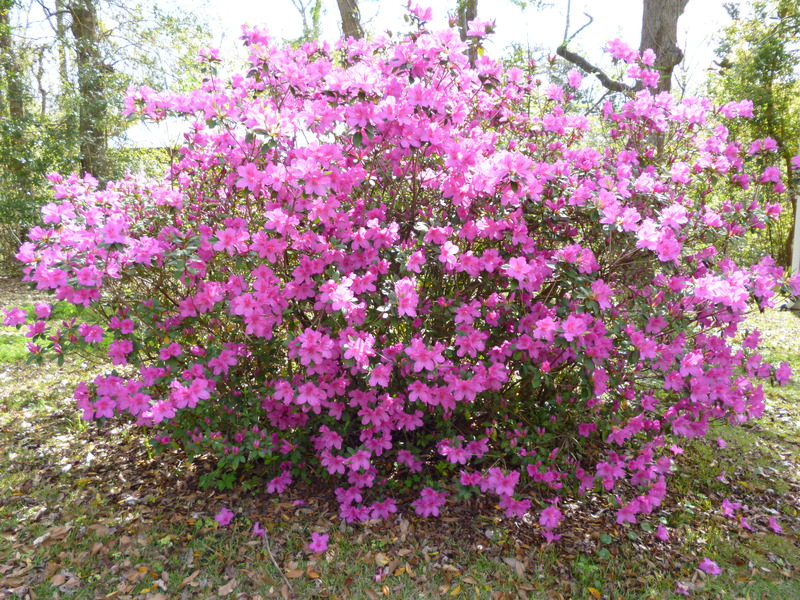 This past week the blooming azalea flowers turned dark green bushes to lush magenta. I, too, am brightening in color and purpose. The vignettes remembering my mother – begun during my illness – have continued, and I thought I would share one written at the center of this week. Azaleas and fairies seem appropriate for now. Mama taught me how to make leis. 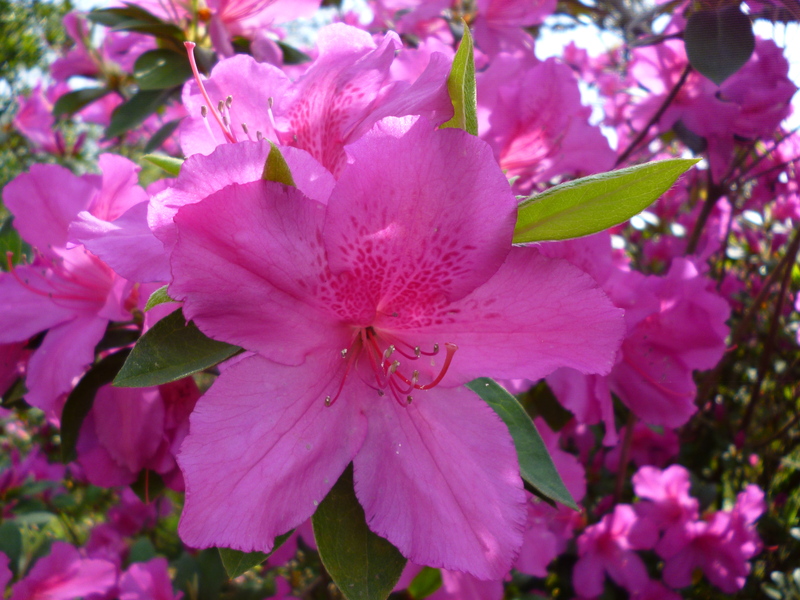 These were the product of Southern springs, when Azaleas bloomed in abundance and Wisteria perfumed the air. I had noticed the blanket of fallen blooms beneath laden branches and one day Mama caught me scooping them up and tossing them heavenward. I made a kind of dance of this; the bright petals swirling en l’air were like fairies dancing. Their skirts in red, pink, magenta and white flared out from tiny invisible bodies that only I could see. I twirled with the fairies. I guess Mama didn’t see the fairies; she only saw me, and, of course, the Azaleas. “You look very pretty dancing with those flowers, Leify. Perhaps we could make you a costume to wear as you dance.” Those were roughly her words. And though I wasn’t aware that I lacked a costume, I was intrigued. My Mama knew amazing things, and besides, with all of the other children somewhere else, I was the only one. I would have her all to myself. Before long we were sitting side by side amidst the cool, sweet flowers, and we each held a needle between the first finger and thumb of our right hands. Looped through the needle’s eye was a long double thread, and at the thread’s end was a small twig to keep the blooms from falling off the lei. Lei? This was a new word, and Mama told me that leis were made and worn in Hawaii for ceremonial dances. She also told me that ceremonies are like what happens in church. The movements, songs, and costumes people wear have spiritual meaning. “There are many different ways of praising God, Leify.” Mama was always a teacher, even at home, and she made everything so interesting that you couldn’t help learning – and loving the process. But now she was taking the first Azalea in her left hand, and poking the point of the needle into its center. Where the stamens had been was a little hole. I watched as the flower slid down the thread and caught on the twig. It was my turn to try. At the time I must have been six or seven, and this was delicate work, requiring patience and co-ordination that I was hard-pressed to master. The flowers were fragile and easily torn, and I was a sensitive child, too quickly discouraged by initial failures. There were probably a few tears shed while I tried to reflect the miracle I saw forming on my mother’s lap. I saw how the blossoms fit perfectly against each other – the front of one embracing closely the back of another. As thin and beautifully made as each bloom was on its own, strung closely together they were a lush and magnificent creation, When Mama had tied the long thick strand end to end, it became a garland: this one magenta from the large bush close to our house. My own lei – barely begun – was forgotten when Mama placed her completed one around my neck, I could only sigh with pleasure and amazement; the feel of the cool, moist flowers against my skin was lovely. I just had to jump up and dance for my wonderful Mama. Now I was the fairy. As the springs of childhood rolled by, the making of leis became a ritual of sorts: one of those occupations that have holy meaning – to oneself, if not to anyone else. I became adept enough that the doing was fairly effortless. The making of the rich, lush garlands was so familiar that I could float in the midst. The feel of the blooms against my fingertips melded with the color and fragrance of the spring day. I inhaled the process and breathed it out. When one of the Leis was completed and held up against the blue sky, I was seeing my Mama’s slender hands as well as my own. In a sense, every lei was a gift that symbolized our closeness on that first day. 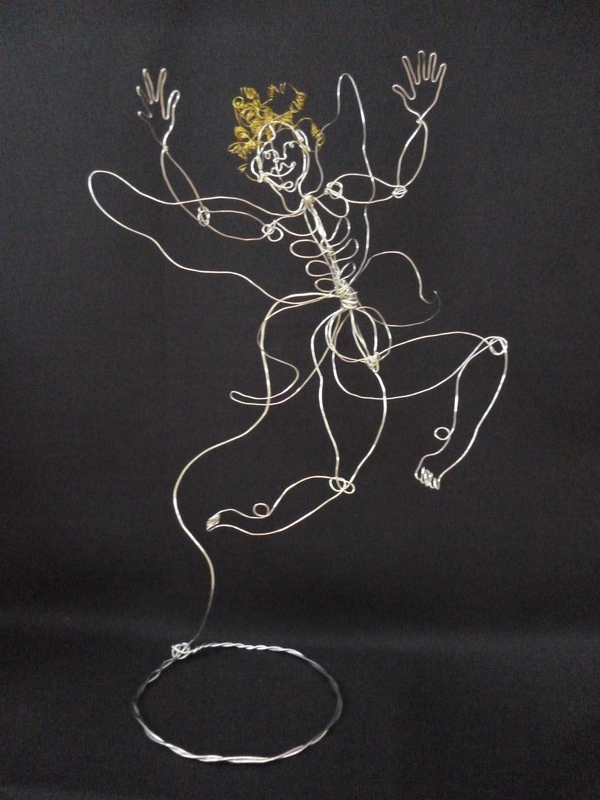 Even today, when constructing one of my own wire sculptures – sitting quietly and letting it bloom in my hands – I can thank Mama for teaching me all I know about quieter occupations. You are currently browsing the A Dance of Balance blog archives for March, 2012.